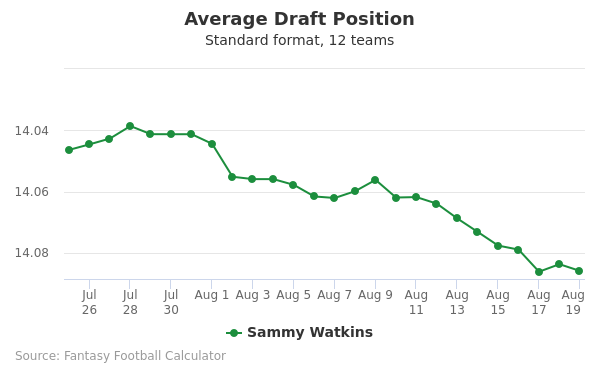 Sammy Watkins's fantasy value is measured by his average draft position (ADP) in fantasy football mock drafts. 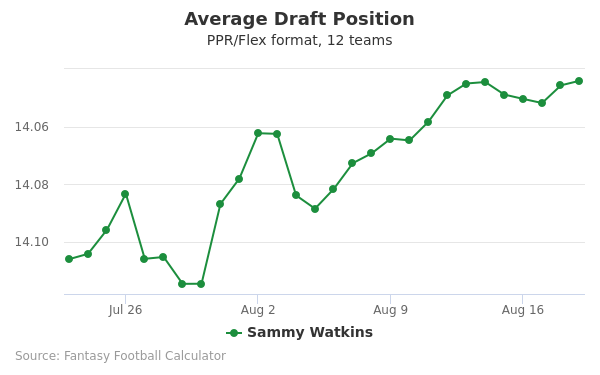 In recent drafts, Watkins's current ADP is 7.03, which indicates that his fantasy outlook is to be the 3rd pick of the 7th round, and 75th selection overall. 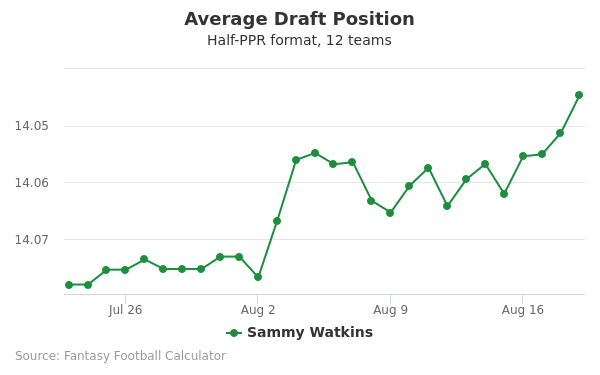 The code below will display a graph that updates every day to show the ADP data for Sammy Watkins for the past 30 days in 12-team PPR leagues. Draft Rashaad Penny or Sammy Watkins? Draft Robby Anderson or Sammy Watkins? Draft Corey Davis or Sammy Watkins? Draft Kareem Hunt or Sammy Watkins? Draft Sammy Watkins or Vance McDonald? Draft Philip Rivers or Sammy Watkins? Draft Matt Ryan or Sammy Watkins? Draft Jerick McKinnon or Sammy Watkins? Draft Carson Wentz or Sammy Watkins? Draft Peyton Barber or Sammy Watkins? Draft Allen Robinson or Sammy Watkins? Draft Chicago Defense or Sammy Watkins? Draft Emmanuel Sanders or Sammy Watkins? Draft Latavius Murray or Sammy Watkins? Draft Jared Goff or Sammy Watkins? Draft Christian Kirk or Sammy Watkins? Draft Josh Jacobs or Sammy Watkins? Draft Royce Freeman or Sammy Watkins? Draft Carlos Hyde or Sammy Watkins? Draft Marvin Jones or Sammy Watkins? Draft Jared Cook or Sammy Watkins? Draft Dante Pettis or Sammy Watkins? Draft Cam Newton or Sammy Watkins? Draft DeSean Jackson or Sammy Watkins? Draft Courtland Sutton or Sammy Watkins? Start Rashaad Penny or Sammy Watkins? Start Robby Anderson or Sammy Watkins? Start Corey Davis or Sammy Watkins? Start Kareem Hunt or Sammy Watkins? Start Sammy Watkins or Vance McDonald? Start Philip Rivers or Sammy Watkins? Start Matt Ryan or Sammy Watkins? Start Jerick McKinnon or Sammy Watkins? Start Carson Wentz or Sammy Watkins? Start Peyton Barber or Sammy Watkins? Start Allen Robinson or Sammy Watkins? Start Chicago Defense or Sammy Watkins? Start Emmanuel Sanders or Sammy Watkins? Start Latavius Murray or Sammy Watkins? Start Jared Goff or Sammy Watkins? Start Christian Kirk or Sammy Watkins? Start Josh Jacobs or Sammy Watkins? Start Royce Freeman or Sammy Watkins? Start Carlos Hyde or Sammy Watkins? Start Marvin Jones or Sammy Watkins? Start Jared Cook or Sammy Watkins? Start Dante Pettis or Sammy Watkins? Start Cam Newton or Sammy Watkins? Start DeSean Jackson or Sammy Watkins? Start Courtland Sutton or Sammy Watkins? Sammy Watkins was Born June 14th, 1993 in the town of Fort Myers, Florida. While living in Fort Myers Watkins attended high school at South Fort Myers High School. An incredible athlete while there Watkins would go on to become a Letterman in basketball, track, and of course football. Watkins success on the football field was clearly visible as during his junior and senior years of playing he would become the 1st team all-state choice. His skills helped lead his high school team to play in the 3A state semifinals where the team would eventually succumb to the Miami Norland team. In 2011, Watkins would get the fantastic opportunity to play in the U.S. Army All-American Bowl. Thanks to his exceptional play in high school Watkins was eventually accepted and committed to playing for Clemson University. Watkins ability to catch and score yards allowed him to catch 82 to passes and score twelve touchdowns his freshman year at Clemson. Watkins performance at Clemson was so great that he became number one in the nation for yards received each game. His final season of college Watkins made an integral choice to skip playing his senior year so that Watkins could enter the NFL draft. His choice would yield a huge payoff in the future and longevity of his career. 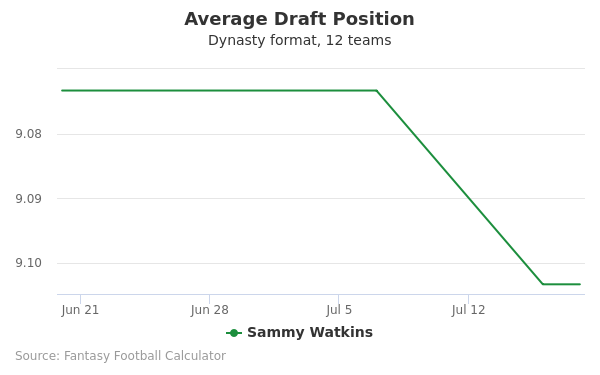 Sammy Watkins pre-draft stats are rather impressive. His achieved vertical was an astonishing 34 inches. Watkins's 40 time equals an surprising 4.43 seconds. His draft stats combined with his performance in college allowed Watkins to be drafted by the Buffalo Bills. Watkins was chosen in 2014 as the 4th pick during the first round of choices. Watkins would eventually go on to sign his salary contract for a whopping four year guaranteed $19.94 million dollars. His draft into the Bills would prove a successful choice for the team and the rookie as he would combine his skills to bring home his initial touchdown in the week 7 of his first season against the dolphins. Watkins started the 2015 season off slow as he was suffering with a calf injury. Because of his injury, Watkins was only capable of playing three of the seasons first five games. Unfortunately, Watkins would only catch a total of 25 passes amongst the seven games that he would first start playing during the season. Watkins made up for his poor early performance. However, with a strong season finish having received sixty catches for an amazing 1,047 yards. Watkins would also score nine touchdowns that season. His performance ended up earning Watkins a top 100 spot at 96 for the top 100 player list in the NFL. Sammy Watkins 2015-2016 highlights can be viewed here. In 2016, Watkins would suffer another injury. Watkins would endure a broken bone that was in one of his feet. Unfortunately, Watkins would have to have a screw placed into his foot in order to remedy the problem. Watkins would eventually be let to play and would finish 8 games with a total of 430 yards, two touchdowns, and 1 fumble. While the start of the season might have been rough for Watkins, as always he managed to push through and finish strong. While playing for Clemson Watkins was arrested for the illegal possession of cannabis. Watkins would later be caught with two controlled substances in the form of Vyvanse and Adderall His possession of the drugs would end up causing Watkins to be forced to sit out the first several games of his 2012-2013 seasons. The charges would later be removed from Clemson Watkin's record allowing him to continue playing without fear of penalization. For fans of Watkins who would like to read more directly from his twitter, they can visit the twitter page @sammywatkins. Fans can also easily pick up Clemson Watkins gear and jerseys online in order to support him during Buffalo Bills games. Clemson Watkins gear comes in the form of jerseys of a variety of different colors. Cancer awareness jerseys are also available in order to support the Bills, Watkins, and of course the amazing cause of supporting the search for a cure for cancer. Watkins is one of many proud players with such a jersey.